The Memorial Overlook, also known as The Residences at Memorial Overlook, represent true luxury living when it comes to condos for sale in Arlington, Virginia. This boutique six-story building only has 35 residences. That’s because the units are huge. Floor plans start at 1,000 square feet for one-bedroom units and climb to over 2,700 square feet for amazing three-bedroom, two-and-a-half bath city homes. 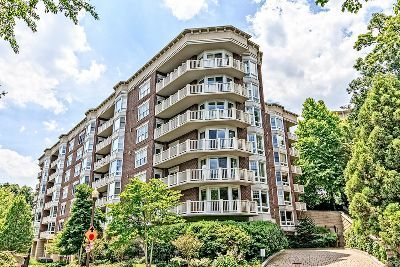 Located in the southern part of Rosslyn near the Potomac River, this upscale brick development was delivered in 2002 but offers a more traditional look than some of the nearby glass and steel towers. Residents also enjoy spectacular views from large wrap-around balconies. Life at the top comes at a price, however. Condos for sale at 1201 Nash Street generally start in the $500's and climb to nearly $2 million. 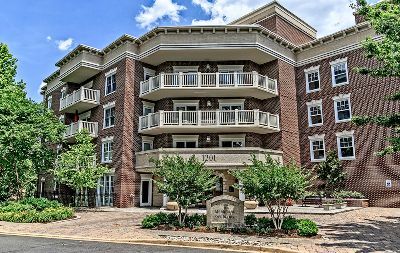 Read More about the condos for sale at Memorial Overlook in Arlington, VA. The development is named for its close proximity to the Arlington Memorial Bridge, Memorial Drive and the historic Arlington National Cemetery, home to so many of the nation's fallen heroes. Enter one of these spacious residences through the marble entry foyer and feast your eyes on hardwood floors, exquisite crown molding, wainscoting and layouts combining open space concepts with elegant formal planning. The gourmet kitchens offer several varieties of hardwood cabinets and either marble or granite counters, along with center islands, commercial grade stainless steel appliances and wine fridges. The luxury continues with gas fireplaces, those impossibly large balconies, huge bedrooms and stunning spa baths with double vanities, whirlpool bathtubs and steam showers. But the amenities don’t stop with individual living quarters. There’s also a beautiful lobby, a state of the art fitness center, a club room with a catering kitchen, extra storage and private garage parking. The Memorial Overlook is also nicely located for commuters, with Arlington Boulevard, George Washington Parkway, the Rosslyn Metro Station and the Key Bridge all nearby. Just wheel out of the parking garage and head over the bridge to Georgetown and Washington, DC, where important business awaits! This luxury boutique building is also close to the Rosslyn-Ballston corridor with some of the best shops, restaurants and nightlife in North Virginia and Washington Metro itself. Whether you want to stay in Rosslyn to dine at one of the many restaurants or head to Clarendon-Courthouse for a fun pub crawl, this is one of the hottest urban centers in the area.